Most of control theory has been developed in a centralized setting, where all measurements are processed together to compute the control signals. This paradigm has conceptual advantages, but also inherent limitations. In contrast, industrial practice often relies on distributed control structures. Hence, there is a strong need for theory and methodology supporting design and verification of distributed controllers. The purpose of this research area is to meet this demand. The idea to use price mechanisms for coordination of large scale systems has a long history in economics as well as in optimization theory. Our research is exploiting similar ideas for engineering applications involving interaction between many sub-systems. In particular, we study Model Predictive Control where the optimization problem is decomposed using Lagrange multipliers. The multipliers can be viewed as prices and the optimization problem is solved iteratively through price negotiations between the subsystems. Special algorithms, called accelerated gradient methods, are exploited to speed up the iterations. Such methods are well established in the optimization literature, but using them for real-time control poses new challenges and opportunities. Theory for multivariable control has mainly been developed in a centralized setting, where all measurements are processed together to compute the control signals. This paradigm has conceptual advantages, but also inherent limitations. In particular, industrial practice often relies on distributed control structures and there is a strong need for more systematic approaches to design of such structures and the corresponding information interfaces. During the past several years we have been actively contributing to an emerging theory for control with distributed information and a better understanding for the fundamental limitations imposed by the information structure. Traffic network models are often expressed in terms of a monotone dynamical system. This means that additional traffic can never lead to reduced congestion. The monotonicity property turns out to be very useful in analysis and synthesis of large scale systems, not only in traffic networks. Our research is devoted to fundamental questions regarding performance and robustness of traffic networks, but we are also trying to see how the methods can be applied to more general monotone systems. We study a class of distributed control laws, comprising a diagonal (decentralized) term perturbed by a low-rank component. See the figure below. A control law of this form reduces the information processing by aggregating information from all systems into a single quantity, which is then made available to each of the systems. These type of controllers appear as the optimal solution to a class of resource allocation problems in multi-agent applications, including wind farms. We study the advantages of symmetry in robust control. In the case of state feedback, an optimal control law can be given on a very simple form for stable finite-dimensional systems with symmetric state matrix. 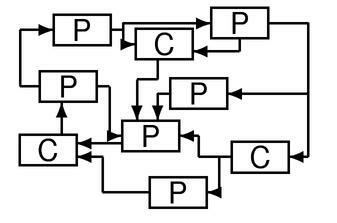 The control law is clearly related to the matrices of the system’s state space representation. We exploit this fact both in synthesis and for distributed control purposes. For infinite-dimensional systems, we investigate the benefits of having the control law on closed-form, in synthesis for large systems. The control law is proposed for temperature control in buildings.